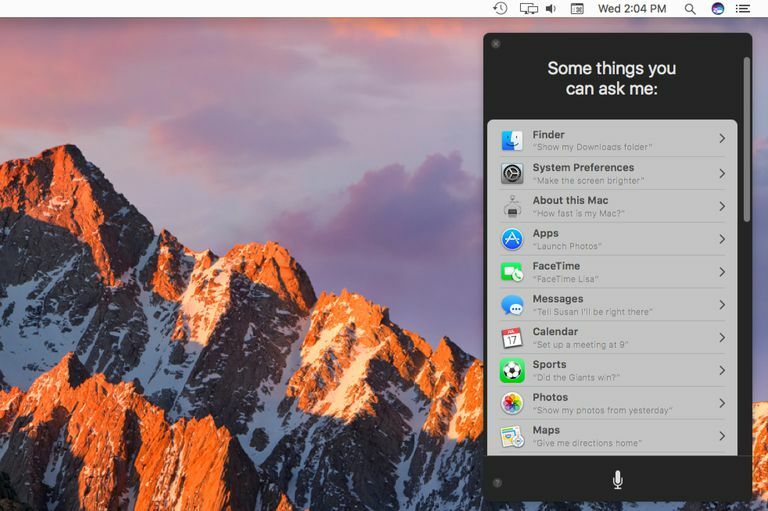 Siri offers a number of Mac centric commands. Screen shot courtesy of Coyote Moon, Inc.
Not only does Siri work well on the Mac, the Mac version of Siri brings new capabilities and features. After all, Siri on iOS devices is limited a bit, because of the available processing power, storage, and memory on an iPhone or iPad. In addition, the Mac has quite a few more peripherals available that could benefit from using Siri as an interface element. "Siri, print and collate six copies of the file 2018 quarterly report"
Siri may not be quite up to that command yet, but it may not be too far off. With the power available in your Mac, it would be easy enough for Siri to recognize "print" as a command to open the default app for the file named "2018 quarterly report" and then print out the number of copies requested. Collating could be a service offered by the printer. Although Siri doesn’t recognize "print" yet, there's already a way available to use a voice command to print from an application. You can find details in the Control Your Mac With Voice Commands guide. While we wait on Siri to gain a bit more intelligence, you can still use it for a remarkable number of commands for features found only on the Mac, as well as for most of the common commands that have been part of Siri since it was first released for the iPhone 4S in 2011. To help you make the best use of Siri on your Mac, here's the 2018 list of Siri commands that the Mac OS understands. How fast is my Mac? : Siri understands a number of variants of this question, including "what processor do I have?" and "is my Mac speedy?" Siri will answer with details about the processor used by your Mac, how many cores it has, and the speed at which the processor runs. Siri will also offer to show you additional details. If you select the Details option, the About This Mac app will be launched. How much memory does my Mac have? : There are a number of different ways to ask this question, and so far, Siri responded to all the ones I thought of correctly by telling me the amount of RAM on my Mac, the speed of the memory, and the type installed. Siri will also offer to show additional details, which will open the About This Mac app. Unfortunately, Siri isn't smart enough yet to select the Memory tab in the app for you. What's my Mac serial number? : Siri will return the Mac's serial number. You can shorten the command to just "serial number" and the same result will be returned. How much free space do I have? : Siri will return the amount of free space available on the startup drive. Siri doesn't understand when you ask this question about other drives, such as "How much free space do I have on Tardis?" (that's my Time Machine drive). Siri also provides the same answer to how much free space and how much total space, which aren't really the same question. How much iCloud storage do I have? : The free space currently available on your iCloud account is returned. Siri doesn't seem to respond well to variants of this question, such as simply asking "icloud storage." What OS version is this? : Siri responds to this question with the version number and build number, such as macOS 10.12.3 (16D32). Get the Travel Plans folder. Each command will cause Siri to search the Finder and display the found folder in the Siri window. Open, Show, and Get can be interchanged. It's advisable to use the word folder in the command, so Siri knows it's searching the Finder for a folder and not opening an application that may have the same name, such as "Open Photos" versus "Open Photos folder." Open the design review file in Pages. "Open" is best used when you wish to launch an app to view a specific file. If no app is specified, the default app is used to open the file. In order to open a file in an app, the file must be unique; for example, saying "Open untitled" will likely lead to Siri showing a number of files with the name untitled in the title. Get the Word doc Yosemite Firefall. An application type, such as Word doc, can be used to help Siri select a file. Show the images on my Desktop. Desktop is a location modifier that Siri understands. In this example, Siri will only look in the Desktop folder for image files. You can use any folder name as a location modifier. Show me the files I sent to Mary. The name you use needs to be contained in the Contacts app. Find the spreadsheet sent to me this week. You can specify dates or time frames, such as today, this week, or this month. For the most part, Get, Show, and Find are interchangeable, however, I found that Show worked better when using a time frame modifier. In all cases, the files Siri found were shown in the Siri window, and could be opened from there by double-clicking the file name. By adding the preferences modifier, Siri won't be confused and end up displaying a general search or opening an app with a similar name. Go to screen saver settings: Opens the Desktop & Screen Saver preference pane and selects the Screen Saver tab. Go to Desktop settings: Opens the Desktop & Screen Saver preference pane and selects the Desktop tab. Open Privacy settings: Opens the Security & Privacy preference pane and selects the Privacy tab. Is Bluetooth on? : Returns the current status of Bluetooth. Turn on Bluetooth: Enables Bluetooth. You can also use the words Activate or Enable in place of the phrase Turn on. Turn off Bluetooth: Disables Bluetooth. Deactivate or Disable can be used in place of Turn off. Is Wi-Fi on? : Returns the current status of your Mac's Wi-Fi system. Turn on Wi-Fi: Activates your Mac's built-in Wi-Fi system. You can also use Enable or Activate in place of Turn on. Turn off Wi-Fi: Disables Wi-Fi on your Mac. You can also use Deactivate or Disable in place of Turn off. Is Do Not Disturb on? : Returns the current status of the Notifications Center's Do Not Disturb setting. Turn on Do Not Disturb: Enables the Do Not Disturb function for the Notifications Center. Enable or Activate can be substituted for Turn on. Turn off Do Not Disturb: Resets the Notifications Center to the default setting of allowing incoming notifications to display alerts or banners. Disable or Deactivate can be used in place of Turn off. Put my Computer to sleep: Invokes Sleep, turning the display off and significantly reducing the power consumption of your Mac. Increase brightness: Turns display brightness up. Decrease brightness: Turns display brightness down. Minimum brightness: Sets the display brightness to the lowest setting. Maximum brightness: Sets the display brightness to the highest setting. Open Mail settings: This command actually opens the Internet Accounts preference pane, giving you access to some Mail account settings, as well as Twitter, Facebook, Google, Linkedin, Yahoo!, and others. Siri knows a number of the accessibility options available on your Mac. Increase cursor size: Enlarges the cursor. You can use the word mouse or pointer in place of cursor. In addition, Siri will display a pointer size slider with which you can fine-tune the cursor size. Decrease cursor size: Reduces the size of the cursor. All of the options mentioned in Increase cursor size apply. Turn on invert colors: The display colors will be inverted, putting white text on a black background. Turn off invert colors: The display will return to the default of black text on a white background. Turn on grayscale: The display removes all colors, rendering everything in grayscale. Turn off grayscale: Returns the display to the default color mode. Turn VoiceOver on: Enables VoiceOver, to provide spoken description of items on the computer screen. Turn VoiceOver off: Disables the VoiceOver service. Turn Zoom on: Enables the zoom function, letting you use keyboard shortcuts to zoom into an area on the screen. Turn Zoom off: Disables the zoom function. Siri should be able to launch any app you have installed on your Mac, especially if it's located in the default /Applications folder. If you have problems with an app launching that is located elsewhere, include a location modifier, such as "in folder name" where folder name is the name of the folder that contains the app. You can use Launch, Open, or even Play, when appropriate, such as Play (name of game) when it's time to take a game break. Launch Word: Launches the Word app. Open Safari: Launches the Safari web browser. Play Full Deck Solitaire: Opens the solitaire game I have installed on my Mac. Launch Touché in Downloads folder: This will open the app Touché, which is located in my Downloads folder. Siri's vocabulary tends to increase with each new version of the Mac OS or iOS that's released. Be sure to check back here for new Siri commands as they become available. If you know of a Mac-only Siri command we haven't covered, you can drop me a note.